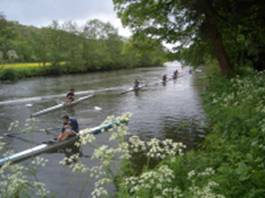 Avon County RC’s annual regatta (Bristol Avon Regatta) takes place on the River Avon just upstream of Avon County’s boathouse, on our straight 1000 metre course. In its heyday, the regatta was called “the Henley of the West”. The Saltford regatta history (pdf 491kb) gives a vivid picture of an Edwardian Regatta. In the 1970s the Regatta moved to Bristol docks, and it moved back to Saltford in 2008.